Local photographer Paul Mowatt and colleagues from KINC are linking in with artists who will donate their original art work to be sold anonymously for a set price of only £35. This will allow people to buy a genuine art work at the fraction of the gallery price, and for all artists to given exposure to a new audience. All the proceeds will go to Mind in Kingston. If you are an artist and you wish to donate a work, please contact Rianne Eimers at rianne@mindinkingston.org.uk for further details. The closing date for submissions is the 12th of May 2019. Mental health problems affect many of us in one way or another at some point in our lives, and it is good to know that support and advice is always available from MIND. Helping to raise awareness is especially important at this particular time, when the taboos surrounding mental wellbeing are being dispelled in media initiatives boosted by the involvement of the younger Royals. Kingston Independent Network of Creatives aims to develop a thriving arts culture in the borough of Kingston upon Thames by enabling professional opportunities for our artists through engagement with communities, local businesses and the public sector. 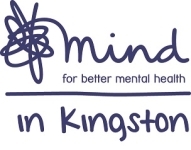 MIND is an organisation providing information, advice, support and services for people with mental health difficulties. MIND services deliver - help for people to live independently in the community, mental health awareness training, user involvement services, and patient councils. In addition, there are two drop-in cafes providing low level support, and a range of activities including a music group and football team.